As a wise man once said, "You got to know when to hold 'em, know when to fold 'em." Okay, that was actually Kenny Rogers’ "The Gambler," but it works in regards to Telltale Games’ newest title, Poker Night at the Inventory. It’s the second time Telltale’s made a poker title (the other being Telltale Texas Hold ‘Em back in 2005) and generally, poker games don’t usually get the gaming world too excited. 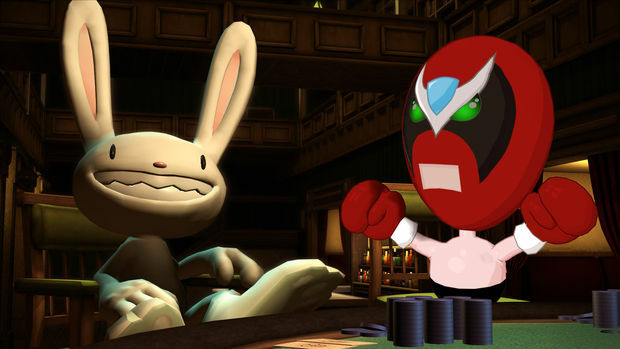 However, Poker Night got a whole lot of press for the fact that it brought four well-known and well-loved characters to the game: Max from the Sam and Max series; the Heavy from Team Fortress 2; Strong Bad of Homestar Runner fame; and Tycho from Penny Arcade, the same comic in which Kenny Rogers appears as Gabe’s guardian of sorts. (See? I told you it worked.) Add in the fact that the game was offering players a chance to unlock five new items for Team Fortress 2 (six if you pre-ordered and got the Poker Visor hat), and it was no surprise that the game would be quite a popular download on Steam. But does Poker Night live up to the hype and will you be playing it long after you buy it? Your answer might depend on how much of a good thing you can tolerate. 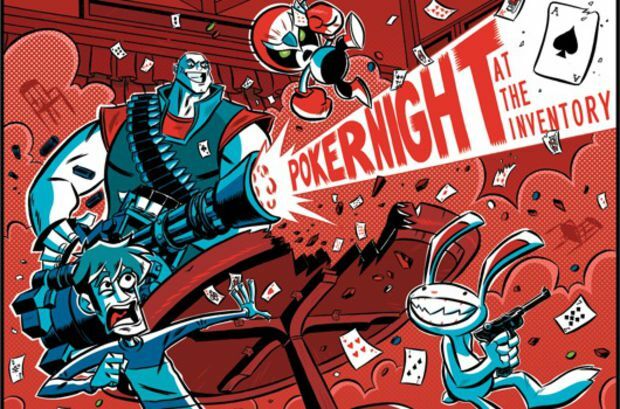 If you're looking for some long story about how Sam, Tycho, the Heavy and Strong Bad all ended up playing poker ... well, there's not much of one. It's just the four of them hanging out and playing at The Inventory, an underground club that supposedly has its roots in Prohibiton, but offers nothing more than a setting. And that's fine, because really, this game doesn't have a need for a story. Visually, Poker Night's a good looking game. The Heavy, Strong Bad and Max all use models from Valve and Telltale's games, respectively, and their animations are very smooth. Tycho's model, on the other hand, is brand-new, and oddly enough, he's the one who looks a little out of place from time to time. There's also a few graphical glitches if you move the game along too fast: in one instance, I couldn't see my cards for an entire hand because they never actually loaded. I'd folded too quickly and skipped to the end of the hand before the game could make the change, it seems. Another cool little feature is that in the background, the characters will appear as you knock them out of the game. 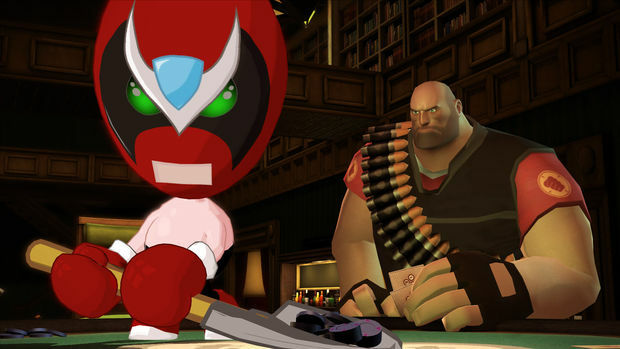 They don't do a whole lot, but it's kind of cool to see Strong Bad playing the arcade machine, or the Heavy at the bar after a bitter defeat at the table. Where Poker Night excels, though, is in the chatter at the table between the Heavy, Tycho, Strong Bad and Max. The scritping and the actual voice acting itself is spot-on, a testament to the abilities of whoever's responsible at Telltale for writing this game's dialogue. Tycho's voice is a bit jarring at first, but you get used to it the more you play, until it seems natural. What's also great is that each character's quirks are also included in their dialogue: for example, there are Heavy's "funny" stories about summer camp that are actually quite morbid, and Tycho's obsession/lust over giraffes makes it into the game, the latter of which made me laugh out loud the first time I heard it. In short, they've nailed the spirit of all four characters perfectly. My only complaint is that they engage each other, but never really bring the player into their conversations. You kind of feel more like an invisible observer than a player at the table with these guys for the bulk of the experience. Outside of their clever quips, the actual computer players seem... well, I'm not sure how to describe them. Maybe a bit erratic? At times, they seem to take unnecessarily big risks or make strange plays, like going almost all in and folding. At other times, the AI seems to know exactly what the flop, turn and river cards are going to be ahead of time, and is able to make strong bets based on that knowledge. I know part of poker is that the game can turn on its head with the draw of the right card and make a winning hand a losing one. But in Poker Night, it feels like those sudden moments are, at times, manufactured by the game more than they would occur naturally. The AI issues seem to get a little better when it's down to just two players, as I had greater success in knocking out my opponent then. 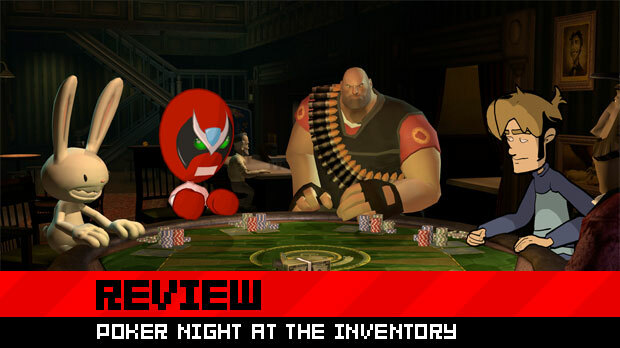 Poker Night's gameplay pretty much boils down to good ol' fashioned Texas Hold 'Em, the kind you see on TV. It helps a bit if you know what beats what ahead of playing this game, as it makes it easier to gamble, but you can definitely pick up how to play over time. Navigating the in-game interface to make calls, raises and folds is relatively simple. Plus, in addition to the new items, winning games unlocks new tables and decks to play with, giving you the opportunity to customize the game's look a little bit. On the downside, there's not a whole lot else you can change. The AI has two difficulty options -- normal and hard -- and you can adjust the level of conversation that goes on as well as if it’s censored or not. But you can’t change anything about how much the buy-in is, presumably to keep people from somehow gaming the system to get the Team Fortress 2 items easily, what blinds start at, etc. Maybe adding in a few other options that unlocked once you had all of the items (and they’re tied to achievements, so that’s no reason this could not have been done) would have helped keep some replay value. All this boils down to Poker Night's biggest problem: it gets repetitive very quickly. Once you've heard Tycho and Heavy's tenth Class discussion for the twentieth time, it loses a lot of its initial charm. On top of that, with no real options to modify the game's stakes, you're always playing the same $10,000 buy-in game once you have the new Team Fortress 2 items. Thankfully, Telltale's included the option to right click through any conversation as a means of speeding up the game's pace and perhaps saving your sanity. The only bad part, of course, is right-clicking takes a lot of the fun out of the game because you're not getting those interactions anymore. So it's kind of a catch-22: sit and listen to Strong Bad and Max's conversation for the fifth time, or skip past it and lose some of the atmosphere. Your call. Now that I've played Poker Night for a bit and have all my shiny new items, I find myself at a crossroads. On one hand, the game has energy provided from the fun conversations taking place at the table. And you definitely get more than $5 worth out of that alone. What kills Telltale's latest game is that, really, there's not enough diversity to keep people coming back ... at least not for more than a game or two when you're bored and have nothing else to do. 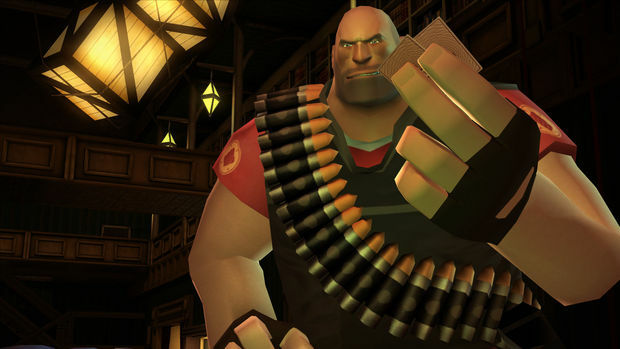 Enjoy the banter between the characters and the new items for you Team Fortress 2 players out there, but just remember one thing: it's a $5 single-player Texas Hold 'Em poker game. Don't expect anything much more than that.